Apple iPhone 5 review | What Hi-Fi? Here it is at last – the Apple iPhone 5. It has been a big 12 months in the world of smartphones. Literally. Bigger is better has been the mantra, set in 2012 by the Android army. Our collective appetite for these super-size phones, from the Samsung Galaxy S III (4.8in screen), to the HTC One X (4.3in) and even the Samsung Galaxy Note (5.5in), has seen Android take an increasingly big bite out of the smartphone market share, collecting a string of positive reviews along the way. So how did Apple respond? With the biggest iPhone launch of all-time for the biggest iPhone yet. The iPhone 5 has a 4in, 16:9 aspect ratio screen, taller than the iPhone 4S and its 3.5in screen, despite being lighter and slimmer in depth. And sure enough, it has already gone down a storm: the iPhone 5 scooped a record two million pre-orders in 24 hours from customers buying on virtual sight. Now those are big numbers. But now we have our hands on one, how does it measure up? Allow us to get to the bottom of it in our exhaustive Apple iPhone 5 review. There’s simply no phone on the market as beautifully put together as the iPhone 5. A new anodized aluminium body is book-ended with glass on the rear of the casing, making for a chassis that feels more elegant than ever while also affording a little more grip than the iPhone 4S. The iPhone 5 weighs just 112g, compared with the iPhone 4S at 140g, and is 7.6mm in depth, compared with the previous generation at 9.3mm. It feels noticeably lighter and slimmer and will make much less of a mess of your pocket. Within hours the iPhone 4S starts to look dated by comparison. Some iPhone 5 reviews have reported scuffing of the iPhone 5 edges – ‘scuffgate’, anyone? – and we can indeed see minuscule marks on the edges of our black device, too. No deal-breaker, the scuffs are very small, but a shame nonetheless and it’s an issue we’ll keep an eye on over the coming days. There are tweaks to the antennae, speakers and mic placement around the iPhone 5 but more pertinently you will find the headphone jack now at the bottom of the unit. That's not a first for Apple but it's a change for the iPhone. We’d imagine it will now slip more naturally in to most people's pockets when earphones are connected, though this sort of thing tends to become habit. More pressing is the new connection. The iPhone 5 has a new, smaller connection: the Lightning connector. More compact, supposedly to allow for the slighter dimensions, it simply means it won’t work with existing docks out of the box: you’ll need to spend £25 on the Lightning-to-30-pin adapter. Far from ideal. JBL has announced the first iPod docks with the new Apple Lightning connector, so you finally have something to dock, charge and play your iPhone 5. You can read more about this in our news story. We’ll be looking to try out the adapter as soon as we can get one. Enough about the look, what can it do? The major upgrade is of course the screen. Now a 4in diagonal Retina screen, the iPhone 5 has a 1136 x 640 resolution with a decent 326 pixels per inch (PPI). It’s still not strictly an HD-ready resolution screen and pales in comparison with the likes of the Samsung Galaxy S III, which sports a 1280 x 720 resolution screen. That said, Apple has done wonders with its displays before, regardless of resolution. Inside there’s a new A6 dual-core processor, which Apple says is twice as fast as the A5 in the iPhone 4S, which runs at a rumoured 1GHz and sports 1GB RAM. The iPhone 5 is available in 16GB, 32GB and 64GB incarnations and there remains, predictably, no sign of an SD card slot for expanding the storage capacity. There's also no NFC (near-field communication), a technology which allows wireless transfer of data and indeed payments between devices. Present on other smartphones, NFC remains a technology very much in its infancy and clearly Apple doesn't deem it a necessary inclusion yet. Last but far from least, the iPhone 5 is a 4G compatible phone in the UK, the first iPhone to be so. You will need to sign up to the UK’s only 4G network, called 4GEE and set to be launched next month by EE, in order to use the iPhone 5 on 4G and make the most of those faster mobile broadband speeds. See our news story on EE 4G for full details. There are two key changes to the interface: the screen now has room for an extra line of icons and it uses iOS 6, the latest version of Apple’s operating system. iOS 6 is a free download and compatible with all iPhones from the 3GS and up, the 4th and 5th generation iPod Touch and both the iPad 2 and the new iPad. Everything you may love or hate about the interface remains very familiar from how apps look to the use of folders, the pull-down notification tab and the crucial role of the home key. Except it’s all faster. The iPhone 5 is lightning fast – and you’ll notice it instantly. Apple claims to have thinned out the glass on the screen, bringing the pixels closer to your fingers, and coupled with the speed of operation it does feel more responsive and the most ‘stuck-to-your-finger’ interface we’ve used. Apple explains the choice of a 4in screen by saying it wants to keep the iPhone 5 easy to use with one hand. And it just about succeeds. Sales of the Samsung Galaxy S III suggest people don’t mind screens far bigger than this, but those jumping from a 4S to 5 will notice you have to stretch your thumb a touch to reach the top of the screen. The notifications bar and the browser bar are two particular areas where you might notice the extra stretch required. Still, Apple obviously feels that 'if it ain’t broke don’t fix it'. But to us iOS 6 certainly feels for the most part the smallest of shuffles forward. Compared with the live tiles, widgets and more of Android and Windows Phone, it’s fair to say Apple hasn’t innovated a great deal on the surface. Apple claims some 200+ new features on iOS 6, but frankly most are rather small tweaks. But there are some biggies, and it’s not all good news. It wouldn't be an iPhone 5 review if we didn't mention the ongoing battle with Google, and an obvious casualty of that strained relationship is the removal of Google Maps and YouTube apps from iOS 6. While you can access YouTube no problem from Google's own app, Google Maps is nowhere to be seen, replaced by Apple’s own Maps app. And, put bluntly, it’s nowhere near as good. Worse, in some places it’s really quite bad. Built in partnership with TomTom, among others, it has some neat features, such as 3D view (see below), but loses others such as Google’s excellent Street View. More pressingly, there are too many inaccuracies and glaring oversights from towns to train stations. A Google Maps app is surely on the horizon and we’ve no doubt Apple Maps will get better over time, but for such a key smartphone tool for many people, it’s a real negative. Siri, Apple’s voice control system, is cleverer than ever and finally comes in to its own by being able to search for businesses, shops, restaurants, football scores, the lot. Previously only US data was available for many services, but that's been sorted and this is the best example of voice control we’ve seen. It's still in 'beta' mode so isn't perfect but it can do a lot more and be genuinely useful. We searched for Italian restaurants and the results were accurate but missed off a couple we could think of. But it's fast, shows results sensibly and allows you to easily click through for more information, maps and more. Similarly searching for football fixtures it pulls up Premier League fixtures no problem but then struggled when asked for League 2. Definitely better and genuinely useful but Siri on iPhone 5 can still improve. Facebook and Twitter are more deeply integrated, with voice tweets and also tweeting from the notification bar, while the Mail app has had a lick of paint, and you can now make FaceTime calls over 3G not just Wi-Fi. On the subject of apps, it’s worth pointing out that older apps need to be updated to the new iPhone 5 form factor otherwise you’ll find black bars at the top and bottom of the screen. At the time of writing many have already released updates so this shouldn’t be an issue for too long. The stock internet browser, Safari, has added some neat features, too, such as the ability to truly save web pages for offline reading, and better access to your camera roll for pictures and video should you want to share them with the world. There are also more options from the shortcut button should you want to conversely share web content via social media, messaging or mail. For day-to-day use, the key thing is the speed. Pages load even faster than before, the processor working staggeringly quickly. We also love the quality of the screen. Whites are whiter, cleaner than previous models, making web pages such as the BBC even easier to read, while yours truly, whathifi.com, has more accurate, more vivid reds, but without being over-cooked as on some Android phones. Text is sharper and crisper, too, noticeable both on websites but also on apps on the home screen. You get more picture on the iPhone 5 in more ways than one. Not only is it a 4in screen but it also has a 16:9 aspect ratio, too, unlike the 4:3 aspect ratio of the 4S. That said, looking at YouTube the size of the picture remained the same for most videos; an update to the app is presumably required. BBC iPlayer was a different story, the picture filling the screen and making a small but obvious jump in picture size. It’s no match for the bigger boys in terms of sheer size, though, so for extended video watching we’d still be tempted to go bigger than the iPhone 5. Even a jump to the 4.3in HTC One S seems noticeable. The natural, understated colour balance remains very similar to previous generations. Watch some HD video and the iPhone 5 is clean, crisp and sharp. Detail is superb. There’s no sign of noise and the sense of depth delivered is second to none. A little more punch and a more dynamic colour palette might be welcome at times, but it’s a classy performer with video, make no mistake. Audio is more interesting. The iPhone 5 sounds better than ever. How Apple does this, we do not know. It’s incremental but apparent all the same, with extra detail and clarity making tracks even more engaging. We used some reference Sennheiser over-ear headphones and affordable SoundMagic E10 in-ears and results were superb. We thought the iPhone 4S was the best-sounding smartphone around – but the iPhone 5 has raised the bar even further. Also of interest are the new bundled earphones. Or EarPods as they are now known. Apple’s infamously leaky and average-sounding freebie buds have been redesigned and given paper-based drivers. The design is meant to be a perfect fit but we know this is a dark art: they seemed OK on our collective ears but not as snug as in-ears with a choice of tips. Check out our news story to see exactly what goes inside the EarPods. And we’re impressed. They sound better than the buds, no doubt, and leak less noise. They’re more detailed and better balanced. But there is a little softness, especially in bass notes, and they lack the clarity and precision of the best in-ears around at this price. For free earphones, the EarPods are decent, but for £25 we’d look elsewhere. Still an 8 megapixel camera like the iPhone 4S, the iPhone 5 camera has had a few tweaks and is some 25% smaller, again helping to enable that lighter, thinner form factor. It now takes pictures – 'up to 40%' – faster and seems more stable in doing so. It does much better in low-light now, too, thanks in no small part to the ‘dynamic low-light mode’. There’s a grid for getting the horizon straight and you can use Panorama mode (above) to perform a slow pan and capture a panoramic shot, which is predictably simple to use and produces great results. A bigger capture button also makes it easier to take shots without shaking the camera, while HD video looks excellent, too. Lest we forget, there’s a 1.2MP front camera in to the bargain, which is a noticeable improvement on the iPhone 4S. Apple claims the iPhone 5 battery life is better – just – than the iPhone 4S, delivering up to 10 hours web browsing over Wi-Fi (a couple less over 3G) and around 10 hours video and 40 hours audio battery life. And heck, we believe them. Day-to-day use made minimal impact on the battery and we easily went 24 hours with average usage. Smartphone batteries won’t deliver much longer than a long day of heavy use and the iPhone 5 battery performed admirably on that benchmark. There remain concerns that the 4G use could drain the battery but until the EE 4G network goes live, we’ve no way of checking that, though reports in the US seem favourable. iPhone 5 call quality is noticeably better, too. 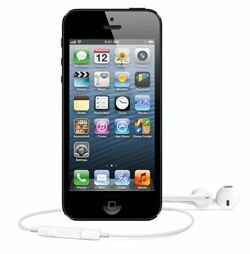 Apple has installed three mics in the iPhone 5, which not only aim to improve clarity but also work in tandem to cancel outside noise. Making calls in a busy office, voices sounded clear. We will review the iPhone 5 call quality over time as we use it more. The iPhone 5 is the best iPhone yet. That is no mean feat, so it bears repeating. Lighter and slimmer yet bigger and faster, better integrated with key software such as Siri and Twitter and delivering the best smartphone audio quality yet – it’s a frighteningly brilliant and beautiful slice of technology. Even the bundled EarPods are decent. But this iPhone review isn't all good. To the untrained eye the interface and iOS 6 looks largely unchanged, which up against the bells and whistles of rival handsets might disappoint, while the screen is bigger but still a way smaller than some of the key players around. Apple Maps isn’t good enough yet, some apps need updating to fit the bigger screen and the issue of needing an adapter for existing kit is far from ideal. But with all that said… the iPhone 5 is the best iPhone yet. Whether it's good enough to walk away with our 2012 smartphone Award remains to be seen.